Series Overview : Susan Foster! Susan Foster! Editor’s note: Dr. Linda Caruso Haviland introduced each lecture prior to its performance by Dr. Susan Leigh Foster. Dr. Caruso Haviland was commissioned by The Pew Center for Arts & Heritage to write this series of commentary on each event and the discussions they engendered within in the context of Dr. Foster’s body of work. All images within the articles are stills extracted from the corresponding video unless otherwise noted, courtesy of Jorge Cousineau, 2012. 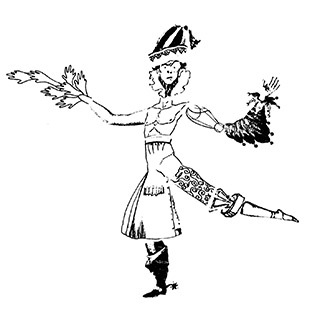 Image from the postcard flyer for Blurred Genres, choreographed by Susan Foster and performed at Dance Theater Workshop May 19–21, 1986. In her danced lectures, Susan Foster deftly maneuvers along and through the borderlines that usually demarcate the well-established dichotomies of language vs. gesture, thinking vs. feeling, and writing vs. dancing. Her surefootedness derives from her work over the last few decades to undermine these very dichotomies by revealing them to be arbitrary and constructed oppositions that, while useful at times, frequently set their constituent elements against each other in convenient hierarchies of power. If the sharp divides have no claim to truth or permanence, if actions or states of being on one side or the other can cross over and stake claim in the opposing territory, then Foster can restructure the power dynamics, play with the boundaries, collapse the categories, open up experiential/cognitive possibilities, or in some other way recreate the landscape on which she dances-thinks-writes, finding her own points of balance as she determines them. Given that ‘body’ rarely ranks over ‘mind’ in western cultures, this means that those of us who dance, particularly but not exclusively if we are female (which may in some cultures be assumed of dancers regardless of gender), are always at the bottom in any social system that enforces this particular set of dichotomies and values those “on top.” This valuing of the written or the thought, particularly if it is framed as objective, distanced, or disembodied, is powerful enough to hold sway even when the grounds for doing so are suspect. As Foster informs us in the second of these three lectures, though the situation has improved, this hierarchy of text and writing over bodied art still holds in academe. So any academic who takes dance as the core of her research can remain potentially unheard, not taken seriously, having all the weight of a woman adrift in deep space and with even less voice. It’s useful to have this as part of the cosmic background noise in or against which Foster’s performances and narratives unfold. 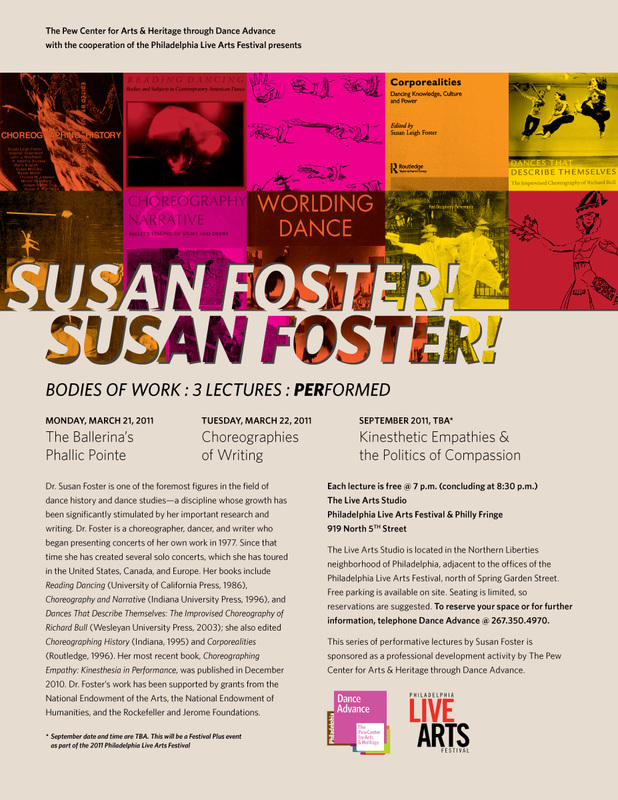 Flyer for the performance series Susan Foster! Susan Foster! Bodies of Work : 3 Lectures : Performed produced by The Pew Center for Arts & Heritage and performed at the Philadelphia Live Arts Studio, 2011. On March 21 and March 22 and, again, on September 11, 2011, The Philadelphia Live Arts Festival and The Pew Center for Arts & Heritage presented Dr. Susan Leigh Foster in performances of three of her lectures, “The Ballerina’s Phallic Pointe,” “Choreographies of Writing,” and “Kinesthetic Empathies & The Politics of Compassion,” each extending into a Q & A with the audience. The notion or act of ‘performing’ a ‘lecture’ already violates a rather neat dichotomy—isn’t a lecture generally somewhat bodily constrained so that nothing detracts from the value of the spoken text? 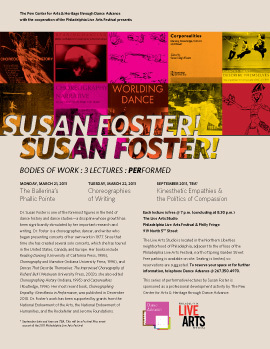 Contrarily, Foster’s ‘performed lectures’ kick huge holes through this divide: they are clearly more than lectures in which gestures simply exceed an acceptable quota in number or propriety, but neither do they function as full danceworks that integrate text as a primary choreographic element. This double agenda—constantly striving to find language that communicates what dance might be, along with her crusade to make academia acknowledge, as she says, their “utter disregard for human movement” (lecture 2 Q&A) while not a dichotomy, per se, nevertheless often puts her own goals in tension with one another. Her response, for better and worse, is not to neatly resolve a binary in favor of one side or the other, but rather to multiply possibilities of text, bodiedness, performance, and to bring all of the elements, and us, along for the ride. Reconstituting past, gendered bodies in performance—who holds the power? “The Ballerina’s Phallic Pointe,” examines the sexualization and commodification of the ballerina’s body. Foster makes her case by analyzing the performance and perception of the ballerina during the period of 19th-century European Romanticism; however, she uses her historical investigations to suggest that things have changed less than we might suppose for the contemporary ballerina. Writing and dancing and, then, writing dancing—revealing the bodily-ness of writing and the capacity of dancing for signification. “Choreographies of Writing” considers the double meaning of “writing dancing.” Writing and dancing have been conceived as two completely distinct activities and placed in a hierarchy that favors the production of text over bodied acts and behavior. What sort of writing is capable of describing, holding, translating, remembering the bodied act of dancing? What sort of dancing might be capable of the conceptual and theoretical work of writing? In answering that, can we, in a culture that values “mind” over “body,” bring dancing into parity with writing and text? The nature and politics of empathetic responses to dance. “Kinesthetic Empathies and the Politics of Compassion” asks the question of whether or not, as human beings, we have an innate predilection for and/or the ability to empathize with fellow beings merely by witnessing their movement and gesture. Evidence ranging from the anecdotal to the neurological suggests that a biological case might be made, but Foster proposes that despite or in addition to any biological foundations, empathetic response and behavior are learned. As a human ability or capacity that operates in social contexts, empathy is likely to be shaped by the socio-political parameters of its historical moment, and the theories that describe the production or transmission of feeling or meaning in dance will, likewise, vary, though each claims truth. Before going on to consider each of the lectures more closely, it might be useful to examine their similarities and differences. Each lecture had distinct focal points and each had its own style and sensibility. The first lecture’s props, for example, campy or sentimental depending on whether or not you ever clutched your very own pink vinyl ballet carry case, circa 1955, were quite different from the utilitarian props of the third lecture. Although theory partnered motion throughout the three performed lectures, the second, perhaps because of both its definitional and satirical aims, was particularly infused with conceptual arguments from contemporary dance, performance, and critical studies. On the other hand, there are points of view, conceptual anchors, and both intellectual and motional strategies that were evident across all three lectures. 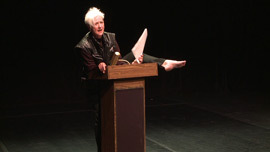 While some scholars have elected to define and value performance based on its immediate and continuing disappearance or erasure into history, Foster, while agreeing that performance is marked by absence, is committed to our ability to reconstitute the presence of the dance and even “celebrate the opportunity to reconstruct it on the written page” (lecture 2). Drawing on different theoretical constructs and happily transgressing disciplinary boundaries, like others in her cadre of dance scholars, she insisted and insists on acknowledging the presence of the body as a very real topic of investigation, and as an important part of her methodology and process of doing history. So, in each of the three lectures we time-traveled into the past: Back to the 19th-century ballet stage and the larger social context that fueled it, and forward again to the mid-20th-century and contemporary ballerinas. Back to 19th- and earlier 20th-century models of dance criticism and forward to possibilities that bring choreography and writing together in ways that empower dancemaking and suggest alternative practices of seeing, thinking, and writing about dance. Back and forth and back again, between Monsieur Chevalier Louis de Jaucourt, French scholar and significant contributor to the great 18th-century Encyclopédie, Note 5 and John Martin, 20th-century dance critic, bringing their theories of empathy, i.e., of transmission and reception in gesture and movement, forward to examine in the light of contemporary critical analysis. And in all of these historical round trips, we witness and consider the aesthetics and the politics of the dancing body, its potential as both a site of meaning and of agency. First, she worked to undermine or subvert the operative assumption that the human capacity to express, present or communicate through dance or gesture can be explained as a fully “natural” reflex. Although Foster is conceptually worlds apart from dance-interested philosopher Susanne Langer, she might agree with Langer’s arguments that expression in dance is more than just a symptom of some disturbance in one’s inner life and that it has important cognitive components. Note 7 Feeling and moving are clearly linked at deep biological levels. Yet to sever this connection from consciousness and consideration dismisses the impact of the world, i.e., social, cultural, and historical forces. Not only does this diminish the power of dance but also works to efface understanding how power dynamics function not just in the realm of art but also in the social and political regulation of all human bodies. Her second strategy was, again, to move past the notion of the purely spontaneous and to frame dance, particularly choreography, as a deliberately and uniquely constructed—over time or in the moment—“bodily writing” that reveals the structural choices and intentions of its maker as well as his or her engagement with the historical and cultural moment. Dance, then, as a bodily writing constitutes a trace Note 8 not only of intentionally expressed personal meaning or significance but also of the encounters between dancing bodies and all of “the discursive and institutional frameworks that touched or operated on them.” Note 9 It can be considered a cultural or historical object in its own right, separate from the choreographer (although not separate from the dancer) with its own identity that includes but overflows the creator’s original intentions. It can reveal cultural dynamics, relationships, or power structures that may have been too close or inconvenient for the original audiences to apprehend or act on. And maybe, just maybe, it is capable of surviving its brief moment of being so that others can think and write or dance about it after the fact. Foster’s lectures, as “bodily writings,” are not exactly like texts in the usual sense of the word and do not utilize the standard components of lectures in the traditional way. Note 10 The words alone are insufficient carriers of the lecture’s meanings and intentions. The gestures are not substitutes for missing words and, although sometimes illustrative of the text, function as frequently to confound or undermine the words or to suggest whole other worlds of possible meanings. As danced, what these lectures communicate to us may never be fully articulated in language, although it may be deeply understood. But, though different in important ways, these performed lectures are also like texts. In them, ideas do present themselves to us for our consideration through the spoken word. Additionally, as a trace or a bodily writing, although neither language nor text as they are generally construed, these lectures leave a material and conceptual residue that is capable of being read, interpreted, analyzed. The danced lecture presents itself as incomplete, open to a sort of readerly rewriting of its meaning by each of us who experiences it. Writing or speaking or thinking about the dance can never exhaust or replicate the rich meanings generated by the dancing body, but there is much that we can dance and say and write about dance and Foster does all of the above. Finally, these are, after all, performed lectures. Although different in content and affect, similar choreographic strategies emerged in all three of the performances. Foster also discussed some of her structural decisions in the Q&A sessions following each performance. It’s clear that Foster is not interested in miming her words with her gestures. Instead, they operate through suggestion, opposition, or various sorts of relationships that create multiple meanings for any single gesture or word. A gesture might not manifest the direct meaning of a word but, instead, reveal some dynamic, shape, rhythm, or durational quality of the concept it denotes—for example, when she dances out the spatial arc and electric rhythm of brain synapses as she talks about the neuron-like aspect of performative writing, which is already a textual metaphor. Gestures also often comment ironically on the text, pairing very serious ideas with movement that borders on the absurd—why is this woman shaving her leg and smacking her calf muscle in the middle of delivering a relatively dense text? Foster chooses gestures that have strong physical components that might provoke equally strong physical responses from the audience: scraping fingernails along a blackboard, crushing her arm between the blackboard and its stand. Gestures, and the props they employ, clearly comment on their social, political, and cultural contexts. There is the podium, material icon of intellectual monologues, but even as the first lecture meticulously sets up the ballerina as phallus, the identity of the podium as male and phallic becomes humorously undeniable, a metaphor that is reinforced in all three lectures. But most prominent among her strategies is the repetition of gestures or movement phrases within any one performance. 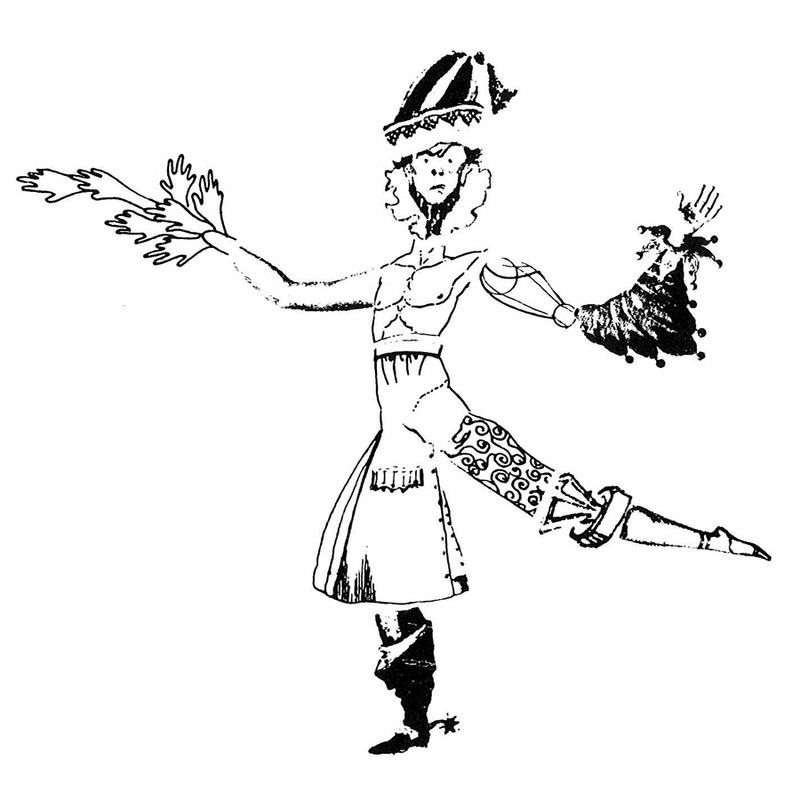 A series of gestures or a movement phrase first appears in conjunction with part of the delivered text; but it will reappear further along, taking on and imparting new layers of meaning as it is paired with a different segment of text and movement. It will reappear yet again, reconfiguring its own meaning and wildly sowing new possibilities over another section of the textual field. It becomes apparent that we are supposed to remain open to the vital and mutable meaning of both movement and text. As Foster explained in the third Q&A, “I was trying not only to create the multiple meaningness of things but also the multiple meaningness of movement.” In the third performance, an added motional intention was to “create a state of ironic tension between what is the same and what is different,” thus reconstructing the argument that she was making in both the second and third lectures. In all of these performed lectures, the dancing ‘text’ is meant to embody the verbally expressed conceptual argument. But although the import of the concept, in written or spoken discourse and in its paired choreographed action, may have a common origin, in the dance it is bodily structured and performed, thus compelling a different kind of ‘reading’ and creating meaning that will be apprehended and understood in different ways and on different levels of our experience. Nevertheless, Foster insists on, through both writing and performance, the intimate relationship between and the equal status of text and the dance. What follows is a necessarily bodied reading of—and writing about—texts in which Foster writes about her reading of the bodily writing of dance. If we’re a bit confused, that’s not a bad place to start as we should abandon all preconceptions, but not hope, as we enter Susan Foster’s world of dancing ideas. “[I]n a classical philosophical opposition we are not dealing with the peaceful coexistence of a vis-à-vis, but rather with a violent hierarchy. One of the two terms governs the other…or has the upper hand.” Derrida, Jacques, Positions (1972), trans. Alan Bass (Chicago: University of Chicago Press, 1982), 41. Algerian-born French philosopher and semiotician Jacques Derrida (1930–2004) was known best for his critical approach to language called “deconstruction,” which sought to reveal the power of binaries in structuring our language and thought; to disturb the text by uncovering elements within it that subverted its purported meaning; and to untether meaning from any possibility of singularity or certainty. His work had profound implications, as well, for revealing and critiquing the power of the political and social in human life. His work influenced fields as disparate as literature, ethics, architecture, law, and art. Derrida’s remedy was first to overturn the binary; but since this merely replaced rather than disrupted the hierarchical structure, the second move necessitated dismantling the oppositional structure altogether. Ironically, Derrida first attacked the dyad of speech/writing, setting out to undermine the western bias towards “speech”, a move which, on the surface, would seem to make a case against bodied expression. However, in Of Grammatology he pointed to millennia of western intellectual arguments that valorized speech as the direct or symbolic expression of the impalpable contents of mind, our mental thoughts; hearing ourselves think or speaking our thoughts directly served as evidence of our fundamental self-consciousness. Writing, on the other hand, had been defined as a physical inscription or sign for speech or voice, thus, twice removed from the mental. It was situated in the same lower strata that housed body, with both considered external to the mind or soul and incapable of providing or revealing our direct presence to the ‘self.’ Even this instance, then, is consistent with most binaries that have, in numerous societies across historical time and geographical space, positioned body and all terms that by their very ‘natures’ carry the same negative connotation on the lower rung of the binary—including woman, sin, darkness, and dancing, among others. Derrida, Of Grammatology, trans. Gayatri Spivak, 1976. (Baltimore: JHU Press, 1998) 30, 35. Chevalier Louis de Jaucourt (1704–79) was a French scholar who had studied theology, mathematics, the natural sciences and medicine. He wrote nearly a quarter of the articles that comprised the great 18th-century French Encyclopedia. Trace is a noun and a verb that carry multiple meanings even in common parlance. But beginning in the late 19th century, disciplines from mathematics to psychotherapy to semiotics, often building on standard usage, developed or appropriated its meanings into complex concepts and theories. Freud, for example, utilized trace to explain mental operations comprising memory. Perhaps the most famous, or infamous, reconstruction of the notion of trace is that advanced, but never fully defined, by Jacques Derrida. Briefly, Derrida rejected the long-standing notion of a fixed and certain relationship between the word, sign, or gesture (signifier), on the one hand, and the object, event, or state of being, on the other hand, to which it referred or which was its source of meaning (signified). He shifted, instead, to an open field of play which was of human devising and within which words or signs or gestures (signifiers) no longer pointed to some thing outside of themselves. Instead, signifiers defined and redefined themselves and generated meaning in a constant interplay of referral and difference among themselves. Because dance is generally understood to be a bodied art form, understanding or explaining and describing the role of “body” in dance has been an ongoing process since at least Plato’s Laws and Republic (fifth-century BC). The many and varied dualisms splitting body and mind that have been established for at least as long, make it difficult, still, to discuss body without using language that frames “body” as purely physical matter distinct from, perhaps subservient to, some abstract, de-physicalized “mind” even as the dyadic split is challenged, and even in the face of contemporary research in neurobiology or cognitive science. In trying to establish a broader or more holistic notion of body, new vocabularies emerged ranging from the multi-hyphenated descriptions developed by philosophers, e.g., Heidegger’s “being-in-the-world,” to abbreviated words that writers hope will, nevertheless, suggest a fuller notion of ourselves in our bodied state of being, such as “bodiedness” or “bodilyness”. In addressing this problem, analyses of dance frequently utilize the same conceptual paradigms and language that influence bodies of thought in their historical periods. Writers who emerge from the practice of dance, however, are generally cognizant of the power of body and our bodied capacity for expression, communication, or other ‘higher’ cognitive states or acts, and often strive to open up, shift, or even subvert theoretical constructs of dance or the dancing body that do not take these into account. This page is designed to print either using the 'Print Article' button or your browser's native print function. Certain elements of the page (the left-hand navigation, the video, etc.) will not be printed in order to provide the best printed reading experience.